Rotafix Under Water Mortar is a polymer modified cementitious mortar that is capable of curing under water. Rotafix Under Water Mortar powder is a blend of special cement powders, high quality graded sand, and a unique combination of polymers and admixtures. The powder, when mixed with water, produces a mortar which is wash-out resistant and waterproof. The material develops an early strength, and can be used above or below the waterline. 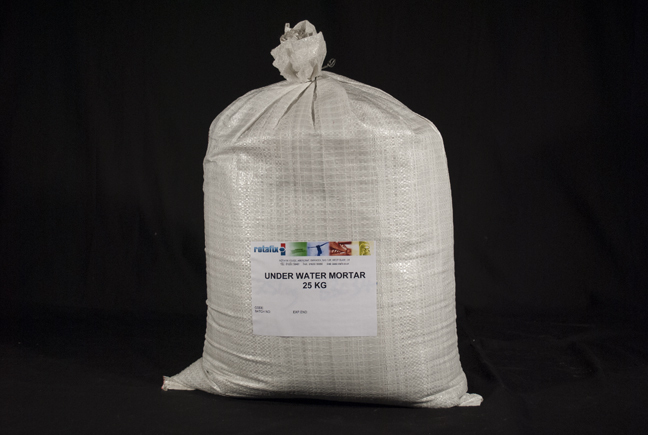 The mortar powders are ready to use, packaged in 25kg moisture proof durable bags, and have a shelf life of 2 years. The mortars develop an excellent putty consistency for ease of application. Can be used above and below the waterline. Will not disperse, wash-out or break up underwater. Strong, impermeable bond to brick, stone, masonry, steel, and concrete. Mortars can be built up to a level of existing profiles in one operation. The mortar can be finished to produce a smooth and attractive surface. The material will not contaminate canals, rivers, reservoirs or lakes. The powder contains no iron, high alumina cement, chlorides or deleterious substances. High yielding, economical, non-flammable, non-toxic, odour free, user-friendly and safe to use in an underwater environment. Offshore locations and underwater applications. To repair and waterproof precast concrete, tunnels, culverts, sewers and pipes. To point and repair bricks, blocks, and masonry above and below the waterline. The repair of concrete in tidal zones where time is limited. The protection of marine structures above and below the waterline. The consolidation of sea defences, harbours, jetties, docks and locks. Caulking material for gaps and joints, and for sealing shutters. To stop and plug the flow of running water or grout through brick or concrete.